Give your medical or pharmaceutical marketing campaign a stronger base to stand on. Target podiatrists and start marketing to them easily with this pre-built, ready-made, downloadable email database, which is full of the contact information you need: emails, numbers, and more! Find the doctors who take care of one of the most important parts of the body: the feet. “Foot doctors," referred to professionally as podiatrists or podiatric physicians, work with some of the most sensitive and used parts of the body. Dealing with everything from warts to sprains to the shifting of delicate, small bones to cancers, podiatrists work hard and use a vast array of tools to help them get the job done. They care for those with foot issues, who are often elderly, injured, or disabled. They also recommend types of shoes, casts, ointments, and practices for taking care of one's feet. If you have a foot-relevant product, whether it be a gel insert, type of shoe, ointment, medical equipment (such as an X-ray machine), or line of crutches, then use this list to market to foot doctors and, by extension, their patients. Getting started is easy; just put one foot in front of the other, so to speak. First, buy and download this product, which takes only minutes. Then, integrate it into your sales software or CRM easily. 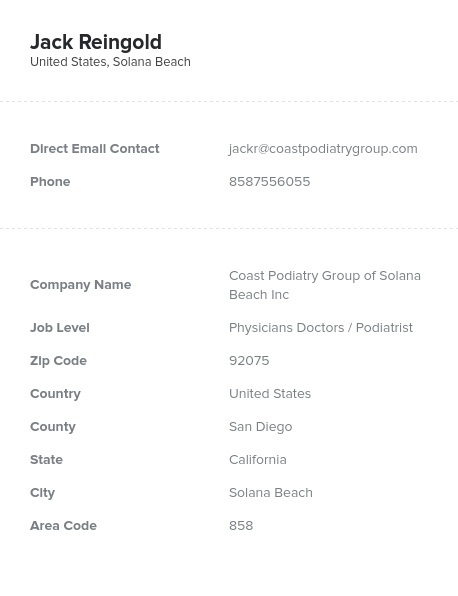 Start connecting right away by email, phone, or mail, as this podiatrist list has all of that relevant information. Try it today!